A couple of weeks ago, I had a very bad NOT cooking week. It was hot out, I was cranky, and all I wanted is take-out chicken wings! So when I woke up that Tuesday morning, I thought I better get that chicken breast cooking in the slower cooker otherwise we will have to break down and order those take-out wings tonight! I looked in the fridge and found some green pepper and onion, so chicken cacciatore it is! I didn’t have a recipe since I was not planning to cook, so I decided just to wing it and hope for the best. When I finally got home from work I tasted my creation, and much to my surprise, it was fantastic! I was fully expecting this meal to be a flop, thinking I had not done enough for it to be in the least bit interesting, but it really was perfectly flavored! I had picked up some capers and super fresh ricotta on Sunday, and these were the perfect finishing touches to a great meal. I digress…here is the 411 on how to make this happen! 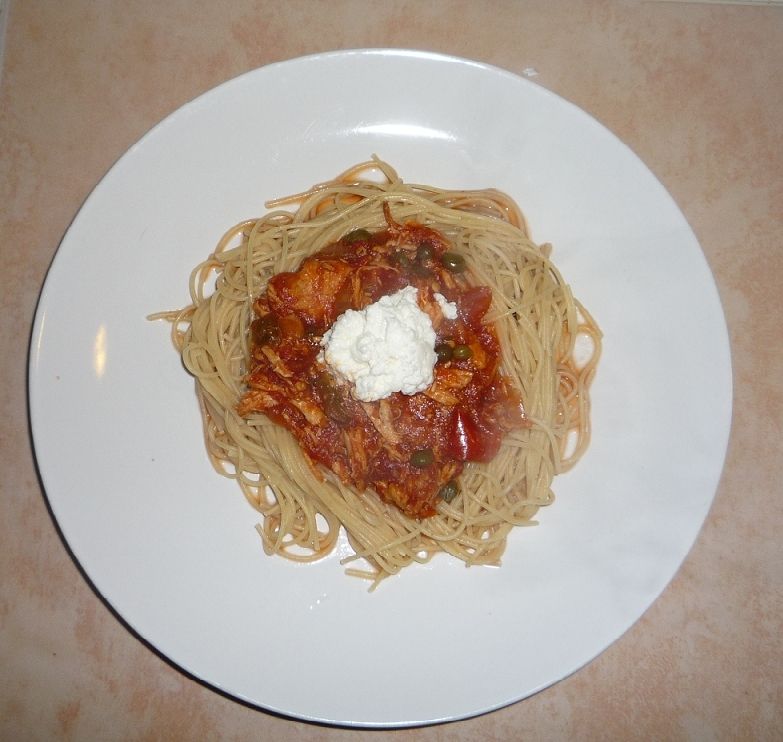 This entry was posted in Recipes and tagged angel hair, cacciatore, capers, chicken, chicken breast, crock pot, easy, easy dinner, italian, onion, pasta, peppers, quick, riccota, slow cooker, tomatoes by reneeh. Bookmark the permalink.